"The Rabbit in the Burrow"
Our esoteric astrologer and Chinese Astrology expert Malvin Artley looks at the meanings of the Chinese Year of the Rabbit in 2011. The Chinese New Lunar Year begins on February 3, 2011, in association with the New Moon in Aquarius, but the effects for all of us cover the whole of the twelve months ahead. Kung Hei Fat Choy, Everyone! Time once again for the Chinese New Year. Of course, it hardly seems appropriate to send salutations given what is about to befall Queensland, but I can tell you there are better times ahead. What a year the Iron Tiger brought us! It has been a year of extremes in many ways and of many things done on a big scale, both human and natural, beneficent and disastrous. One would expect no less from the Iron Tiger—or any Tiger for that matter. We might be wooed into thinking, then, that the year to come would just have to be better, right? Rabbits are so cute and gentle, soft and unassuming, are they not? Doesn't that mean that this will be a gentler year? Alas, 'tis not to be! Rabbits on the whole are a gentler expression than Tigers to be sure, but Iron Rabbits? – well, just don't back one into a corner. You might just get the shock of your life, much like the knights in Monty Python and the Holy Grail did at the Cave of Caerbannog. That was a white (Iron) rabbit—and we all know what happened there! There are times when one just simply has to sit and rethink one's life. Life on the plain had been a mixed blessing in the past year, with times of plenty and periods of great difficulty. There was more grass and food there than had been the case in years due to good falls of rain, yet at times there had been too much rain and the animals who lived below ground had really suffered as a result of the wild swings in weather and resultant floods. A storm was approaching from the west on this particular day and the slate-colored clouds and the winds that bore them made the air heavy with moisture. As the pressure dropped at the face of the approaching storm front the animals of the plain began to seek shelter from the weather to come. In the distance the sky lit up with dazzling displays of lightning and the low rumble of thunder in the distance bade an ominous welcome to all who ventured out in the darkening afternoon. The White Rabbit sat at the entrance to her burrow, her body composed like a statue as she concentrated on the events unfolding around her, her nostrils flaring as she sniffed the air, shivers of anxious excitement occasionally undermining her otherwise focused mien. The White Rabbit was especially vigilant as she watched the storm approach, as some members of her litter were still out foraging and she grew increasingly worried. Fortunately they did not have to venture far from the burrow, as there was plenty of good growth to go around. Still, a mother worries about her charges, and she had a larger than usual litter this year due to good food supplies. As a result, though, the predators of the region had been more active as well because there was more for them to choose from, too. 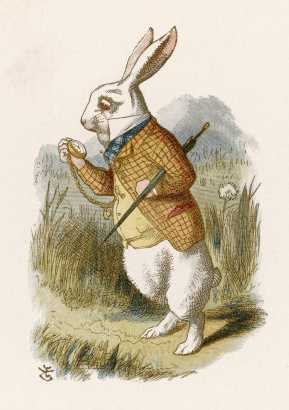 Fortunately, today the White Rabbit did not have to worry about dangers from overhead. The winds had become too strong and the birds had sought the safety of their roosts an hour before. There were still weasels and foxes to deal with, however, and the storm was getting too close. Weasels had been a particular problem that year, as they liked to invade the warrens in search of their prey, and the White Rabbit had seen a couple of them in the area earlier in the day. She wanted her kits at home. Enough was enough—the White Rabbit began to thump out her alarm, and one by one her one young ones raced into the burrow. She and her mate had made their present burrow and connecting warrens on higher ground to avoid the floods that had occasioned the plain that year, but that made them more vulnerable to detection from predators. The other Rabbits in her area had done the same, except for a few that were too afraid of detection. Some families that year had been completely wiped out by either weasels or floods, sometimes both, and there was a sense of something always about to befall the ground-dwelling inhabitants of the area, even though there was a great plenty there for all. “It is strange,” the White Rabbit thought to herself. “The more one has, the greater the stress.” Life seemed to her to be a lot easier when there was not so much to go around. There were fewer mouths to feed, fewer predators, fewer worries about what to do with what they had. In times of plenty there was always something to do and less time just to sit and think about things or to enjoy family life or the beauty of the plain when there was plenty for all, and the Rabbits seemed to be much more competitive with each other, probably because there was less space for everyone and competition among the young bucks for their own mates seemed particularly fierce in times like these. The White Rabbit remembered the earlier part of her life when she started coming into the family way. She was different from the other rabbits. Being white, she stood out from the others and she had trials aplenty as she grew up as a result. The other youngsters in the area had constantly taunted her about her appearance, calling her strange and that her mother had obviously had relations with someone other than her 'supposed' father. What did the others know of genes, anyway? Apparently, there had been other White Rabbits in the family line, as her mother had related to her time and again, and they had a proud history, being known as some of the smartest and bravest in the area. That made no difference to the other rabbits and they were merciless in their taunting, probably because they had heard the truth and wanted keep the White Rabbit in her place, secretly hoping she would not outdo them later in life. Their taunts had toughened her and made her smart, though, making her think of ways to outdo her rivals and prove her mettle and heritage. Alas, their fears finally came to pass, as the White Rabbit's main suitor in her early years was an alpha buck who had also heard the stories about her lineage and was intrigued by her, not wanting to settle for some run-of-the-mill doe from the crowd of young hopefuls. That alpha buck was her mate to that day, as they had bonded for life and had raised many litters together—some of them with White Rabbits, too. Her mate was nowhere to be seen that afternoon. Where was he? Had he been taken by a hawk earlier in the day, or encountered a wild dog or fox? It wasn't one of the weasels she had seen earlier, as weasels usually went after the young, and they would be no match for her big alpha buck in a one-on-one fight. She had once seen her mate go up against a weasel who was foolish enough to enter one of their burrows when he was close by. It was a sight to behold and her mate was a ferocious opponent, sending the seriously wounded weasel packing in no time. When he was courting her she had also seen him go up against other rabbits who were trying to woo her and he had trounced them all, inflicting serious injuries on a few. She had never worried about him being out on his own. He had always been close by, had been good with the kits and had consistently shown he could take care of himself. Perhaps it was the approaching storm that was affecting her and making her uneasy, but today she was worried about him. It was not like him not to answer an alarm. The White Rabbit's fears were soon to be allayed, as before too long the remainder of her litter finally straggled in, followed immediately by her mate, who had been bringing up the rear and corralling all the strays. He had run off one of the weasels in the process, too, as it had been stalking one of the kits, hoping for a last-second meal before the storm hit and hoping as a bonus to have his repast in one of the burrows in the area. Her family all finally together, she could breathe a sigh of relief and make final preparations for the storm bearing down on the plain. There was much to be done. Entrances had to be sealed, the younger kits had to be put in the main chamber, the older kits had to organize food and calm the younger ones who did not really understand what was about to happen. They had prepared well, for they had seen the havoc wrought by previous floods and had stored food away for such times. Having a larger clan now it was easier to prepare for the hard times. “Much can be accomplished at home with the aid of family,” the White Rabbit thought to herself. “Success is not gauged by the number of possessions, but by cooperation.” When they all pitched in the results were just amazing to all of them. They knew the number of possessions was not the measure of their success, as they had seen all that they had worked for washed away in previous floods. Possessions meant little when they could be taken away in an instant. What mattered most was that they were together and had made a success of things together. This time, though, they had learned the secret of surviving the flood and they had stored away not just food, but stones and straw to plug the entrances of the burrows and keep the water out. Valuable resources are put to good use, and they had learned valuable lessons from past hardship. Some of the other rabbits of the plain were not so diligent or smart, however, and the White Rabbit worried for their safety. They had been warned, though. Perhaps they would follow her and her family's example after this. Finally, the rain started to fall. It was to be a heavy downpour and the flood waters would lap at the entrances of the burrows, but they were safely plugged with the stones, straw and earth that had been stored just inside the burrow, just for such an emergency. The White Rabbit and her clan were safe and sound, now. Her cousins and friends in the connecting warrens were the same, as they had followed the White Rabbit's advice and example. Hopefully the weasel had been washed into the gullies below the plain, never to be seen again. Hopefully those less fortunate on the plain had made it through the flood without incident, but she feared the worst. In the end, though, her family was safe and prospering, as well as her friends and cousins. They had all learned valuable lessons in cooperation through their hardship on the plains and life was much better for them as a result. Everyone on the plain had learned that a White Rabbit is nobody's fool, certainly no pushover, but always the best sort of friend to have around. In part two of this article, Malvin examines the Chinese Year of the Rabbit in 2011. 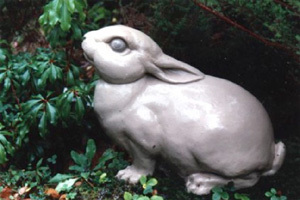 Malvin explains the astrological energies and outlines the nature of the Rabbit in Chinese Astrology, drawing out the examples of Rabbit years in the past, showing how they apply to this one. Quotes and text are taken from the software The Imperial Astrologer, courtesy of Esoteric Technologies. www.esotech.com.au. Graphics and koans courtesy of the same. All text in the program is by this author.